Since Adalyn turned 7 months each day we've seen more and more progress towards her crawling. It has been so fun to see her wake up each morning and be just a little better at it. For awhile she would get so frustrated because she wanted to go somewhere, but just couldn't get all the parts to work together. Her attempts would often end with her giving up and getting there via rolling. When you go in to get her from a nap she is up on all fours practicing. She certainly puts all her powers into "nailing" a milestone. As of the last couple days she has it down! The arms and the legs are all working together. When she sees something she wants she "targets" into it and is off. Maybe a dirty dog tennis ball, one of Shane's various toys laying around, dirt on the floor....you get the picture. We are now on our toes keeping sure Little Addie isn't attempting to consume something she shouldn't be. The gate has been put up and the plants have been moved up. Watch out! Adalyn is on the loose and she is getting faster and faster every day. These are the cards we made for my June card class. It was a full class and we had a lot of laughs! We embossed the heart and a little something on the inside of this card. The new technique of the night. This was our "warm-up" card. I wanted to do something 4th of Julyish, but for any occasion. 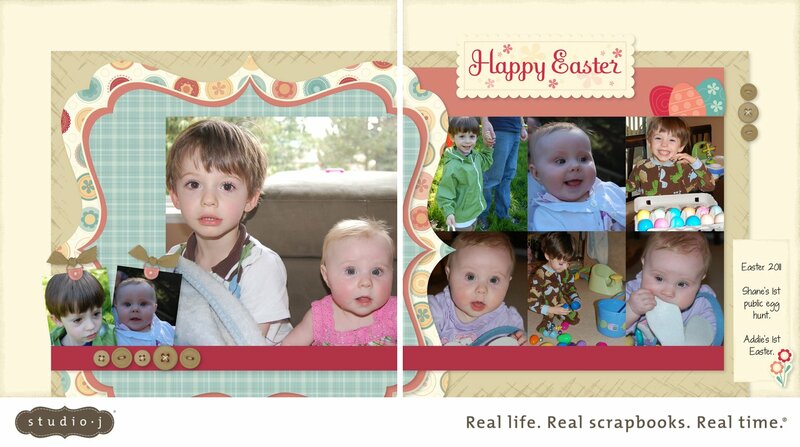 We did A LOT of stamping to make this card. Very fun to make. In July we'll be making a banner. The technique of the night is rosettes. They are addicting to make!! We'll be using this one as a "design", but I am giving the ladies some freedom this month. They get to pick their paper and do whatever word they want to do. Anything under 8 letters! They can even add pictures to it if they want. I haven't quite decided how I am going to finish my summer one off yet. I have 3 spots open. If you are local come join the fun. Wanna join my Walking Madness team?! On July 16th we will be walking in the Take Steps, Be Heard for Crohn's and Colitis Walk. The walk takes place at Magnuson Park in Seattle and starts at 4pm. It is a causual 2-3 mile walk. Okay...so really right now my "Team" consists of Kenny, Shane and Adalyn. If you'd like to get out on what should be a nice sunny day and help out a great cause, I'ld love to have you walk with us! If you can't walk with us, but would like to support the Crohn's & Colitis Foundation, you can make a donation on my page here. Every dollar helps find a cure for these diseases, so don't be afraid if you only have a $1 or $2 to donate. I was talking to Shane on the phone last weekend when he was at Mema and Papa's. I was checking in to see that he was doing okay. Shane: I don't miss you. Me: Oh, okay. That is fine. Do you still love me? (we often talk about when you miss someone that just means you love them lots). Shane: Yay, I love you, I just don't miss you. Except when it was bedtime, he all of a sudden missed me so much he couldn't go to sleep. Hmmm...I will always wonder if he really did miss us that much or if it was just an excuse to not go to bed?! The mind of a 4 year old. Wow, the 7 month pictures I found of Shane are crazy. First, I don't think 7 months was his best looking age. Man, does he look goofy! I think he grew into his ears because they look huge in these pictures. I just took out his calendar and Addie and Shane both seem to be doing relatively the same things. Trying to crawl, wanting to stand up (Shane was pulling himself up at this point), eating finger foods, drinking from a sippy cup. Shane was holding his own bottle and saying more "words/sounds" by now. The word/sound part is weird since he was so delayed in his speech. He also got his first tooth by now. I swear Adalyn has been teething for over a month, but no sign of a tooth yet. He always had his arms up like this. I guess for balance. I can't remember when he finally stopped, maybe around 1 year. This picture made me laugh and brought back lots of Shane memories of how he looked when he was unhappy. --Go out and look and bunk beds in stores and buy one that same day. --Find time to put it together (which was quite the challenge...both finding time and putting it together). --Move his bedroom furniture around numerous times to get everything to fit and look good. --Find and go purchase not one, but TWO mattresses. --Search online and find bedding for his new bunk bed. --Wash bedding when it arrives. The end result...a super happy 4 year old and two happy parents that that project is over with! As Shane would say "This is one special day." He also got a trampoline for his birthday from Papa and Grandma Booth. Another quote from Shane: "I am a lucky boy." And he certainly is a lucky and loved little boy. I stumbled upon this great blog last week. It is actually where I got the idea for the watermelon shark for Shane's birthday. It's full of great activities and ideas for the kiddos. Today she is having a fun give away. Spy books from Giggle Junction. I love them! We need one for our next car adventure we'll be having at the end of July. Check it out and leave a comment for a chance to win your own. My almost 4 year old had on a onesie in size 0-3 months!! It fit over his head and he got his skinny little arms in it. All that didn't work was the buttons at the bottom. I couldn't stop laughing and he was so proud of himself. Next he came out in this outfit in size 9 months. The waist fit him, the legs were just short. I had to put a stop to the clothes trying on after this because he was getting upset that he couldn't get everything on. I was having a hard time getting him to believe me that they weren't suppose to fit him. The pictures still make me laugh. My skinny boy. The final touches were put on the kitchen a few weeks ago. It is so nice to have that project completed!! The end result has been wonderful. I think I love all the counter space the most. The other day I was thinking about how I have enough room to have a mess in one spot and still be able to make dinner in another spot. We love the bar area, too. It's just the perfect place for meals, snacks and projects. Or just to sit and hang out while someone else does work in the kitchen. And of course all the cabinet space is great. There is still room on many of the shelves. It is hard to remember what the kitchen was like before this whole remodeling business started. I'd say we are super happy with the way it all turned out. Of course in hindsight there are always a few oh, we should have done it this way, or that way may have been easier. It was a learning experience for sure. Please excuse the dirty floors and countertops. And I had a baby in my arms while taking pictures, too. Time for more summer fun activities! Monday -- We made pinwheels as you can see above in the picture. There are lots of different directions online. We made very basic ones that don't move. Shane wasn't happy at first that they didn't move, but he got over it. Wednesday -- We are going to make fresh pesto. I recently purchased a basil plant for the kitchen and it has grown so much I need to do something with it, so pesto it is. Adalyn Makenna is 7 months old! It feels like she truly just turned 6 months. Now we are past the half year mark and screaming down the run way to 1 year. It is going to be here sooner then we can even imagine. Enough about the future. This is what Addie is up to right now. Whenever she is out, we always hear about about how she has a "surprised/happy" look on her face. It's true, she really does. She continues to be happy all the time. Full of smiles. Through all this happiness though, she can make herself very well heard with loud screeches. She is not afraid to voice her opinion. She is rolling all over the place. Little Rollie Pollie. There are hints of her thinking about crawling. She is making backwards movement and getting up off her belly. She also seems to want to stand more then any thing. She makes attempts at pulling herself up or "asks" for you to pull her up so she can stand. Addie loves finger foods. None of that baby food stuff. She wants real food. Bananas, pancakes, puffs, watermelon...yummy! She laughs when you bring her over food. She gets so excited for it. Sleep continues to not be one of her favorite things to do. Up on average 2-3 times a night still. I do think that if she eats a "big dinner" full of rice cereal she does sleep for longer stretches. She has gone up to 7 hours straight, so I know she had it in her. It just seems that every little thing bothers her sleep: shots, being sick, learning new skills, not napping as much, going to bed late, teething, habit 5:30am wake up. Once we "fix" one thing something else becomes a problem. Shane had his 4 year well kiddo check up this week. This is how he looked when we went. Doctor coat and medical bag to boot. He decided to wear this after hearing that he may have to have shots. Being dressed as a Doctor seemed to help calm him down. Luckily, no shots were needed at this visit. But we were warned that next year at 5 he'll need FOUR! --Kindergarten is made of up four parts: Emotional, Social, Intellectual and Physical. All equal in importance. All these areas need to be ready for Kindergarten and Shane currently has a bad case of Separation Anxiety making the emotional and social aspect of his life pretty difficult right now. Waiting until he is 6 to enter school makes the most sense for him at his point. --Why push a kiddo into school at barely 5 years of age? No real reason, really. We figure there is no reason to push him and have him behind instead of having him go at 6 and be really ready for his new school life. --Won't he be bored? Nope, I truly believe he won't be bored. A school setting should be prepared for where you are at your learning stage. Plus, Kinder isn't all about academics, it is just as much social and emotional and that certainly won't keep him bored. I'd much rather have him go into school knowing more then not knowing enough. --His preschool has a "Fives" class just for this purpose. Kids with late birthdays and who just aren't quite ready for the school transition. --His Doctor even recommend that all kids with birthdays after May 1st wait until the next school year. Shane is June 10th, so he meets that criteria for sure. This decision in not set in stone. Kinder registration starts in January and of course we can enroll him up until when school starts in September. But at this point he'll be home with me for an "extra" year. Not really what I had originally envisioned, but I am going to attempt to enjoy our extra time together before school takes over his life. Shane had his fish themed birthday party this weekend. We had 6 girls attend. Oh ya, 6 girls! He did invite a couple boys but they weren't able to make it. But you would think that he didn't know a single one of them by the way he was attached to either me, Kenny or Mema. I do believe all had fun though. We made a cute floating fish craft, went fishing and played Shark, Shark, Fish. This is Salvador. Kenny spent a long time making Sal. We thought he was pretty darn cool. You can get directions to make your own Salavador here. Shane, Adalyn, Opal and Dahlia. The first time Addie and Opal have met. Just for the record, it is super hard to get 4 wiggly kiddos to all look at the camera at the same time! Oh, and Addie LOVES hair. The girls were so super excited during presents. They couldn't contain themselves. Many told Shane what they got for him the moment we opened the door. He is very slow and cautious when he opens up presents. He kept telling me he wanted to save that ribbon, or envelope, or wrapping paper. The girls just wanted to ripe things open. He was going way too slow for their liking. Last week we missed a few days since it was Shane's birthday week and Mema was in town, the "schedule" was a little off. There will be some repeats from last week for this week. Tuesday -- Peanut Butter Pine Cones for the Birds (we are going to slather on some PB and bird seed onto some HUGE pine cones we have and hang them up for the birdies to eat). Thursday and Friday -- Shane is off to see Mema and Papa for a few days in Sequim! Monday -- I am having dinner with the bible study ladies, but will leave something behind for the boys...probably spaghetti, since I really really dislike that dish and Kenny loves it. Close To My Heart is offering a way to support those affected by recent severe weather in the US. 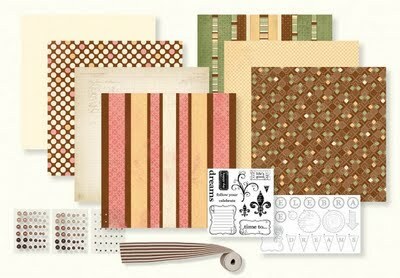 This kit was offered last month as the May National Scrapbooking Month promotion. Now you have the chance to purchase it and raise funds for the survivors of the severe storms that have pummeled the Midwest and Southern states. 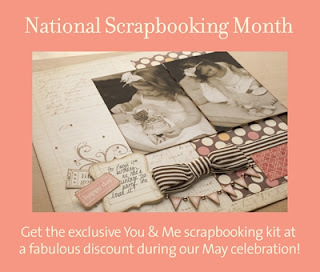 During the month of June, order a You & Me kit for only $15 (a retail value of $34.95), and a portion of the proceeds will be donated to the American Red Cross 2011 Floods and Tornadoes relief operations. Stronger Together campaign will continue until June 30 or while supplies last. Visit my website and use order #CC1012B or email me and I will order the kit for you. During our Studio J Free-for-All in June, we're giving everyone a FREE Studio J JPG file—no purchase required! Simply log on to Studio J, create a layout, then order one JPG file of your layout during the checkout process. It's as easy as that! We're offering one free JPG file per customer account during June, so customers who already have a Studio J account are ready to log on and start creating. If you don't have an account, no worries—you can log on and create an account and then order your free JPG file with no strings attached. Make June the month you check out Studio J with our FREE JPG promotion. --Have it printed and add it to your scrapbook album (most places that print pictures can print 12x12 pages these days). --Have it printed in a 4x6 or 5x7 size and use it as a birthday invitation, this years christmas card, father's day card, thank you cards, baby annoucement...the possibilities are endless. --Post it on Facebook or to your blog. --Send it in an email to all your family and friends. --Print it and have it frame as a gift (Father's Day is right around the corner!). Check out my FREE JPG that I made. I'll be using this stamp set in an upcoming workshop where we'll be making Event Calendars. Cute and versatile! Happy Birthday to Mr. Shane. He is 4 years old today! Here is his birthday interview. To go to the grocery store and to pick out my favorite food and get a cookie. Shane's 1st year of preschool has come to an end. With all the crying and whining about going, he sure keeps talking about it all the time the past week he has been out. I know he loves going, but it has been so frustrating to go through whining all morning long before hand and tears at drop off (even at the end of the year!). Since I took Adalyn with me to his end of the year ceremony, I only had my Ipod with me. The pictures and video aren't the best. This is Shane on the first day of school. He looks so little!! Next year he will go 3 days a week! Free is good. Zip, nada, zero, nothing! That’s how much you will pay to receive one free JPG file of your own making using Close to My Heart’s Studio J online scrapbooking program. There’s nothing to buy and nothing to download. The program is so easy to use, if you can send an email with photos attached, you can use Studio J.Yep, it is that easy! Just log into your Studio J account or quickly create one if you haven't yet. 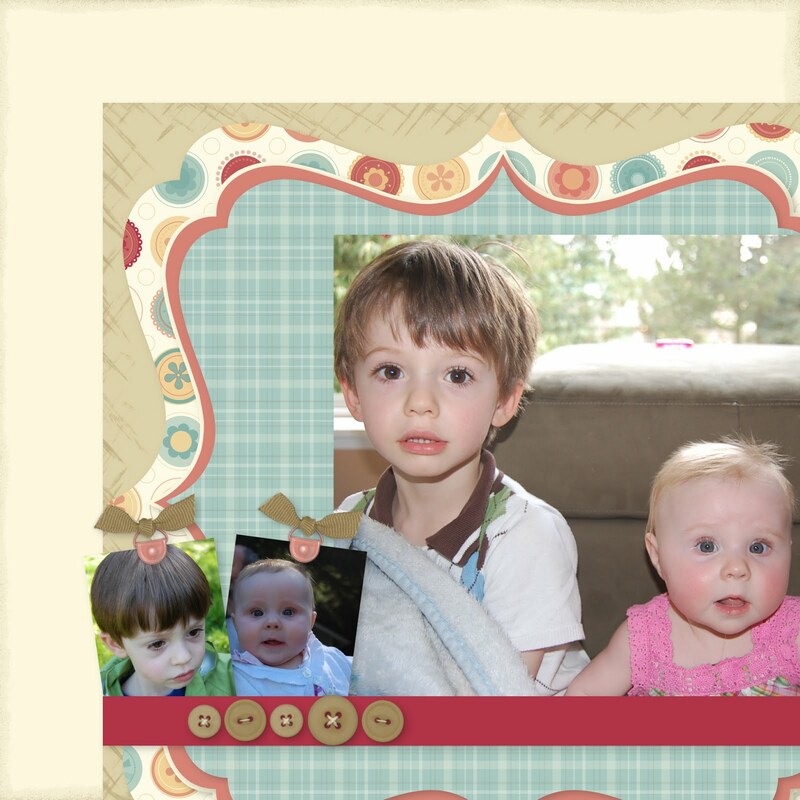 After you’ve created your layout, your JPG will be emailed to you. All you have to do is download it and voila the possibilities are endless. Post it your blog or facebook, email it to friends and family, send it out for printing, or make it into a father's day card by printing it in 4x6 size. Really...so many things you can do with it. This offer is good for the entire month of June, limit one JPG per customer. To get started, visit my website! With summer pretty much upon us....meaning Shane's Preschool has come to an end and Speech is just about over. We will have even more time on our hands at home. It's difficult to get out of the house with Adalyn's crazy napping schedule (she still is taking 3 naps a day) I wanted to come up with something fun for Shane and I to do every day besides the normal play outside, go for a walk, read books, toys, coloring, etc stuff we do every day. I've searched and searched for a book that has fun activities in it that covers science, cooking, crafts, etc all in it. But I can't find anything that fits what I am looking for. (I seriously think I need to write my own at this point!) I decided to come up with a weekly summer calendar. This is what I have in store for our first week. Monday -- Octopus Puppet (I did revise this idea from a Summer Fun book from Scholastic). The best part of this art project is he actually played with it all day!! Friday -- Have a picnic lunch outside, along with matching coloring page. I'll link up as many of the ideas as I can. I just stumbled onto this website with a lot of good ideas that are adaptable. Last week the Menu got skipped, but I had just been to the grocery store and the Yakima Fruit Market (where I like to get our fresh produce during the spring and summer months). Making it a lot easier to plan the meals. Today Shane asked my why I always talk about the crock pot. It was cute. Lately there just doesn't seem to be enough time in the day to get it all done. Once again the To-Do list has grown long. And the Blog is at the bottom of all of it. I have tons to say/blog about, but I just haven't found the time to sit down. I hope to be back up and blogging this week. This last weekend Kenny, Adalyn and I were all sick. We didn't get to enjoy the first warm sunny weekend of the year. We were able to work in the yard yesterday and catch up on some cleaning chores though. --There is a new bed in the house. --I know a boy who is days away from turning four.